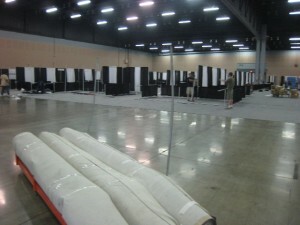 Setting up for a trade show, expo or convention requires a tremendous amount of equipment. There are samples, display materials, inventory, marketing materials and many other things that you or your exhibitors may not be able to transport alone. When freight shipments need to be arranged, Southeastern Convention Services can help. We provide handling for all freight shipments and materials for you or your exhibitors. The materials can be shipped directly to our warehouse and stored, then delivered on the day of the show, or we can handle unloading and unpacking shipments delivered directly to the convention hall. Our labor is fair and affordable and this makes setting up for your next big event much easier and stress free for all involved. Call us today to learn why we are the number one choice throughout Atlanta and the Southeast for trade show materials handling. If you are organizing a convention or trade show, likely there will be several materials that will need to be ground shipped by a freight provider. Southeastern Convention Services can help you, not only through the process of choosing a provider and setting up your shipment, but we’ll also take possession of your shipment, store it, unpack it and set it up at your event. We extend this service to you or your exhibitors. This is because at Southeastern Convention Services we truly are committed to taking all of the worry and stress out of putting on a big event. When you work with us, you can relax and rest assured that all of the details are being handled by true professionals. We have over 20 years of experience in the trade show and expo industry and we know what it takes to put on a successful event. If you are looking for a Southeast convention material handling services company, please call 1-888-608-EXPO or complete our online request form.